I haven’t blogged about my DNA testing for a while, so I thought I would share what happened on Friday. I created an Online Tree at Ancestry.com that was linked to my recent DNA test there. 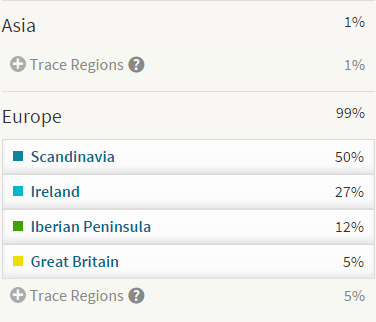 It is an AncestryDNA autosomal test. 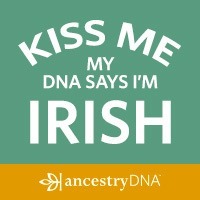 There is a lot of information about Autosomal Testing at Ancestry.com DNA. It was a little surprising when I first looked at the results, but thinking about it, this is taking ALL of my DNA, not just the Y-DNA that I may have talked about before. A couple of days ago, I was reviewing my results and saw that I had a New 2nd cousin. Now, I know the first “2nd Cousin”. He is really my 2nd cousin once removed. We have chatted about the results a number of times. But this new one was of interest. I opened up my genealogy database and THERE SHE WAS !!! I immediately sent her a private, (DNA) Message from the website, letting her know who I was and that I know how we are related. The three of us share a common, Great Grandfather (for me), and Grandfather for the gentleman at the top of the list. Two brothers and now a Sister connection. My new cousin and I are in the same generation, while the first person is a generation before us. We are, however, not that far apart in age. Friday, of last week, I got a reply to my “hi how are you” message, asking me to call her. What a long morning waiting for me to make that call. It was like 6 am for me, and I knew where she lived, so I wasn’t going to call at Oh Dark Thirty. What a phone call this was. We shared the excitement of talking to another about OUR RESEARCH. You don’t always get to talk to family where the other person is interested in the details of our research. The long and the short of this conversation is that she has Letters from our common Great Grandfather and his wife, along with letters from MY Grandfather. I knew he had letters, but somewhere along the line his letters have been lost. Not only letters but pictures AND she is willing to share them with me. She told me that she had already shared, over the years, letters that she has with the brother of the gentleman also on the DNA list. A lot of the data that I have collected was from my Texas (and Arizona) cousins. So the Texas, Colorado, and New Jersey (formerly Pennsylvania) cousins have re-connected, with DNA to prove it. I see a “road trip” in the near future. Can’t wait for mail from her. To be able to, finally, be able to read my grandfathers letters, with the bonus to see Samuel Worthington and Sarah Catherine Reeve’s letters. I do hope she throws in a couple of pictures. Can’t wait to get them and to be able to share them with my Aunt, who has her 96th birthday in a couple of days. Guess it’s fess up time. And why not do it on St. Patrick’s Day. I am glad that I am participating in the Mastering Genealogical Proof discussion in the Dear MYRTLE’s Genealogy Community on Google+. I am going to need it, so that I can understand where this DNA results come from. 27%. Where of where did that come from. 5% Great Britain? Looks like the Paper Trail of my research and the DNA results are in conflict. The earlier DNA (Y-DNA) also provided conflicting information. So.. blah, blah, blah. Drives me crazy. So, I get this email response to a question about the Worthington Family History Society DNA Project. Of the group who were tested, 36, I was in a group of 4. The four of us all are in the US, and close to our common ancestors home. In fact, one lives in the SAME TOWN as our 6th Great Grandfather. Not long ago, I made this Blog Post: New Thoughts on “Brick Walls”. I still think that is true. When I started to do my Family Research I kept running into information that just didn’t look right. When I tried to “cross the pond” there was conflicting information, names and dates that didn’t make any sense. So, I stopped. Not that long also, I posted a message for a trial “peer review” and one comment was that you don’t have Negative Evidence but Negative Findings. Thank you Elizabeth Shown Mills of EvidenceExplained.com fame and author of a book by the same name. Also, I learned a lot while we did the Mastering Genealogical Proof a book by Dr. Thomas W Jones where we learned how to work with the Genealogical Proof Standard. I have blogged about that, and won’t talk about it here now. I changed my thought process about the term BRICK WALL. I had stopped for 10+ years about trying to find Who were the Parents of Capt John Worthington (1650 – 1701). At least i have a specific Question to answer. Didn’t even know about that until a couple of months ago, thanks to Dr Jones. I followed a Shaky Leaf and actually saw a Baptismal Record from the early 1600’s in the right location. Wow, I can start to look for Capt John. But life got in the way. 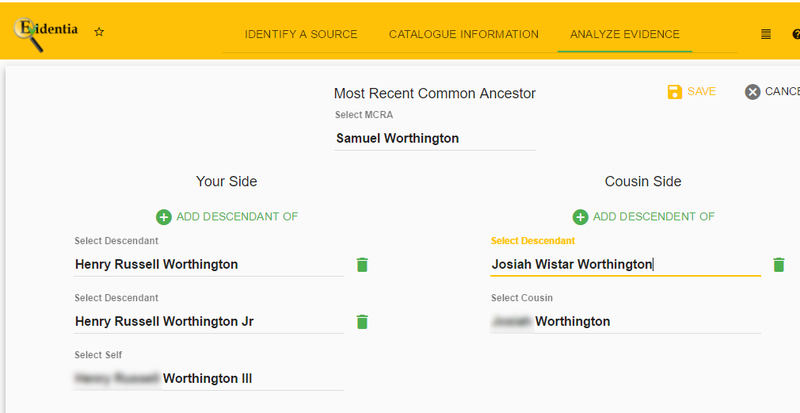 I have been working with a lot of data from the Worthington Family History Society 17th Century Project where a team of Worthington researchers at look at gathering, verifying information and creating 17th Century Pedigree Views. I am still not making a connection. One of my US based cousins put together a very credible view of the ancestry of Capt John. Resolved conflicting information after putting his research together, lots of great documentation. However, some of his conclusions were part of what I had looked at a very long time ago. I wasn’t uncomfortable with what his conclusion was as there was nothing to argue about. Totally credible information. J2 is what my results are. All 4 are in the vicinity of Maryland. So, I sent an email to the Worthington Family History Society for a Status Update on the Larger Project hoping the someone from the United Kingdom had been or will be tested. Hoping someone from across the pond would be a J2. No such luck. Just as I was loading the car for a 3 hour drive to Baltimore, I did a quick, final check of my Email. A RE: (reply) to my email question. OK, here comes the answer, gotta read it. If a distant relative cannot be found to confirm this there are two possibilities: one, that your line is from a founding family in the 14th century and we have not discovered a matching line or two, that you should match another known W(orthington) line but that there has been “Non Paternal Event” (illegitimacy, adoption etc) sometime before Capt John resulting in a different Haplagroup. So, my “brick wall” may have become a Black Sheep. OK, that sort of backs up my earlier concern about the relationships that I had seen early on; the stuff that didn’t quite make sense to me. Elizabeth Shown Mills was right, I haven’t looked in the right place. But thinking about what Dr Jones brought up, maybe I haven’t asked the Right Question. Driving down all of the information that I could remember was running through my mind. What did I miss? What do I want to go back to look at again. I thought about the term FAN Club (Family, Acquaintance, and Neighbors). (Wish I could note who presented us with that term). I have followed some of the FAN Club, but who did I not look at close enough? I am going to re-look at the FAN club and change my research Question. I have a couple of thoughts on both. I have had a couple of Why questions that have been around from the beginning. It would appear that today’s DNA Technology may disprove a number of conclusions that I have seen all over, if these DNA results are right. I have received my 2nd set of DNA results from Ancestry.com. The first test was “old” and I was very discouraged by the lack of connections with anyone. I moved the results to FamilyTreeDNA, which did confirm one connection and maybe let to two others. But, nothing firm. 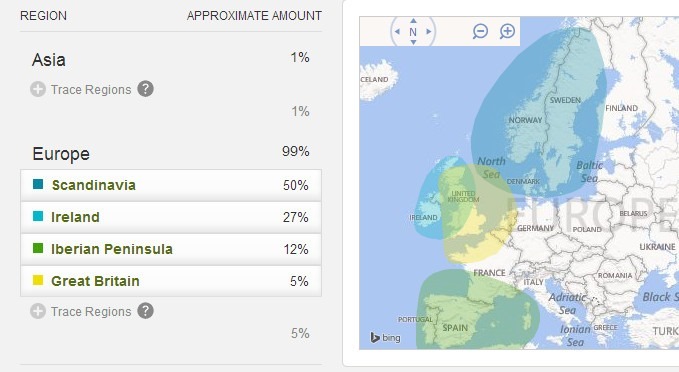 The new test results at Ancestry.com is new technology and returns an Ethnical view of my ancestry. Still not very helpful. BUT, that has now changed. I first received a couple of emails with “hint” to others, in the 3rd to 6th cousin range. Communicating to several of those with similar results didn’t help too much. I looked at the Ancestry Member Tree (AMT) that was provided, but the names didn’t make too much sense. One of the issues, I think, it that WE all are thinking about the “old” version, where it was surname based, and not location based, which is what it appears these new results will show. I received another email, with some new hints and I wanted to see if I could understand what I was looking for. Remembering the Location vs Surname thought that I had, I printed a Surname Report from my genealogy database management program, with the list of surnames back 6 generations. That should help me look at another persons tree to see if any of those Surnames are on my list. I have 53 surnames back 6 generations. I then looked at this first example, 3rd to 4th cousin range to see if any of my 53 surnames were there. Sure enough, there was one. Not only that, but it was in the right LOCATION. Comparing my file against what was in this persons AMT I had my “hit”. I didn’t have much on this specific person, but I know the surname and in my file I actually had this person in my file. Middle name was different, but I had it. Looking at where I received the information on this person, my mother actually had a newspaper article on this person. Having her scrapbook, I tried to locate the article, but the scrapbook is in really bad shape and I couldn’t find it quickly. Will take more time with that book so that I can share this article with my potential cousin. The relationship from the “common” person is Great-Grand Aunt. It would appear that the prediction was right on the mark. Email has been sent to my new found “cousin” and we’ll go from there. In her blog post she said that her cousin “went to bed as a J2 and woke up as a J-M172”. Wait a minute, J2, I am a J2. So, I went to my Family Tree DNA page, and sure enough I am now a J-M172. Now, I have no clue what all of that means, but I am hoping that in 2013 I can learn more about that. There are 4 matches on my profile. I know one of the names listed, have spoken to him in the past, and we are descended from the same person, Charles Worthington. The 2nd person on the list had a name that contains several familiar surnames, but the 3rd name (me being the 4th name) I didn’t know. His surname wasn’t familiar. Not too many hints on his profile, where surnames and places are listed, so I dropped him an email trying to determine the connection. This morning, I received a reply, not connection yet, but both of us are willing to see where the connection is. I went back to his profile and found 2 surnames that are “may be” potential. One is a very long shot, the 2nd isn’t such a long shot. So, a DNA journey may have begun. Thank you Judy from brining us up to date on what is happening in the world of DNA. You are currently browsing the archives for the DNA category.